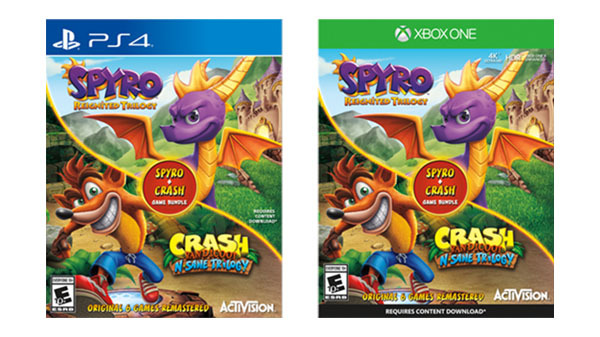 Several retailers are listing a Crash + Spyro Game Bundle for PlayStation 4 and Xbox One due out alongside the release of Spyro Reignited Trilogy on November 13. For $59.99, it includes both Spyro Reignited Trilogy and Crash Bandicoot N. Sane Trilogy. Retailers listing the bundle include Wal-Mart (PS4, Xbox One), Bull Moose (PS4, Xbox One), Provantage (PS4), Blowitoutahere (PS4, Xbox One), Sidescrollers, and Game ‘n DVD Exchange. Rekindle the fire with the original three Spyro games: Spyro the Dragon, Spyro 2: Ripto’s Rage!, and Spyro: Year of the Dragon. Then spin, jump, and wump as you take on the three Crash games that started it all: Crash Bandicoot, Crash Bandicoot 2: Cortex Strikes Back, and Crash Bandicoot: Warped. Crash Bandicoot N. Sane Trilogy is available now for PlayStation 4, Xbox One, Switch, and PC. Spyro Reignited Trilogy, as previously stated, is due out on November 13 for PlayStation 4 and Xbox One.